Monica Melissa Patterson listens to closing arguments in her capital murder trial in the 370th state District Court at the Hidalgo County Courthouse on Nov. 1, 2017. 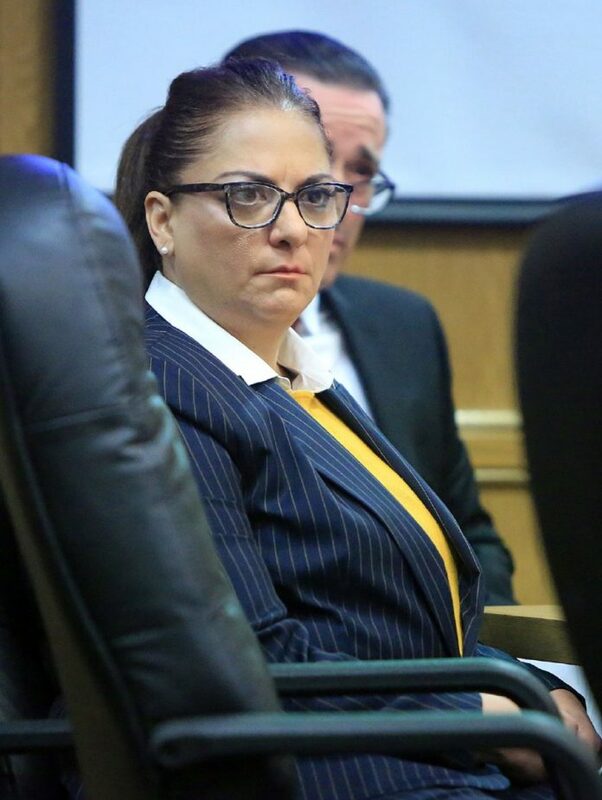 EDINBURG — Monica Melissa Patterson’s appellate attorney has filed a motion for a new trial after a jury found her guilty of capital murder in early November. Patterson’s request for a new trial challenges all four counts on which she was convicted, including capital murder for remuneration, aggravated theft, attempted theft and misapplication of fiduciary funds. State District Judge Noe González will rule on this motion at a hearing set for Jan. 8. Patterson’s appellate attorney, Brandy Wingate Voss, argued in the Dec. 4 amended motion that Patterson “is entitled to acquittal” (of guilt) on the first two counts, a dismissal of the third and a reversal in conviction on the fourth. In regards to the most serious offense — capital murder — which carries an automatic life prison sentence, the motion states that “the evidence was legally insufficient to support party liability for capital murder,” because there “was no evidence” Patterson committed the murder as a primary actor. It goes on to state that there was insufficient evidence that Angel Mario Garza, the man who allegedly suffocated the victim in the case, Martin Knell Sr., in January 2015 was promised or received payment for carrying out the crime. In Texas, the Law of Parties states that a person can be held criminally responsible for the actions of another. “(The) defendant cannot be liable as a party to capital murder unless the state proved that the primary actor — Mario — committed capital murder for remuneration as well,” the motion reads. Garza, who has been in jail since his August 2015 arrest, has yet to go to trial and his next pre-trial hearing is scheduled for late January. The motion also argues that Knell’s live-in caregiver, Celestina Mascorro, who was the sole witness to the crime, “was an accomplice as a matter of law, and thus, her testimony required corroboration,” which the prosecution failed to do. “Mascorro’s testimony shows that she attempted to help conceal the crime by waiting to call 911 and lying to the emergency medical and law enforcement officials who arrived,” the motion reads. The motion also takes issue with the judge’s admitting of a forensic pathologist’s testimony about Knell’s cause of death, something that Patterson’s defense team raised during the trial, charging that the pathologist relied too heavily on “investigative information” from law enforcement when reaching her conclusion that Knell died by asphyxiation, likely by suffocation. As a result, the motion argues that the pathologist failed to rule out other causes of death. With regard to the theft count, Voss argues that there is “legally insufficient evidence” to show that Patterson’s former employer, Comfort House, was a tax-exempt nonprofit during the entire period in which the theft occurred; that the theft amounted to more than $100,000 but less than $200,000; and that Patterson used the funds through deception. Lastly, the motion states that “the evidence is legally insufficient to support a conviction for attempted theft” of Knell’s estate and further argues that the will contest between Patterson and Knell’s son is a civil matter. Patterson was executrix and a beneficiary of Knell’s will at the time of his death, and Voss argues that there was no evidence that Patterson got Knell to change his will through deception or coercion, and asks that the judge reverse Patterson’s conviction on this charge. Voss does not comment on pending cases. Patterson remains at the Hidalgo County jail because the judge previously granted her motion to remain there until the completion of the motion for a new trial process.